Map - See Central Coast Map NSW - Central Coast Weather. Only a 1.5 to 2 hours drive north from Sydney, the Central Coast has stunning beaches, beautiful National Parks, lakes and bountiful bird and wildlife that have attracted visitors to this area for a long time. All along the coast, there are numerous beautiful beaches. The Entrance, Forresters, Terrigal and Avoca offer excellent estuary and rock fishing with famous surf spots to match. While there, explore some of the historical museums and the many antique, arts and crafts galleries. Taste some freshly brewed coffee, and explore the many local markets, offering all sorts of hand made goods. The region also has a growing collection of excellent restaurants offering Australian, international and fresh seafood cuisine. The Entrance is regarded as one of the most cosmopolitan towns along the coast, all in a beautiful setting. Great for swimming, walks in the bush and beach coastline and long regarded as a fisherman’s paradise. The town is surrounded by lagoons, lakes and beaches. Tuggerah Lake has various cruises operating for enjoyment of the tranquil scenery. Another of the beautiful places to visit is Avoca Beach, which has a number of excellent well known surf beaches (Pines Charity Surf Classic is held here) as well as Avoca Lake. Great place to stay if you want to explore more of the Central Coast, but it has many of its own delights, with kayaking, scenic flights, good fishing, great restaurants and entertainment at night. A 1km long beach, named after one of the original settlers, Robert Forrester. The main drive along the beach has a familiar name, Kalakau Avenue. Nearby are Warberal Lagoon Nature Reserve and Wyrrabalong National Park (Aboriginal for headland looking over the sea) with plenty of marine and bird life. Visit Crackneck Lookout for sweeping vistas. You can go paragliding there amongst other things. At Ettalong, waterways, lagoons and beaches offer safe swimming for young families. The beach is near Bouddi and Brisbane Water national parks. You will also find a popular weekend market operating there, offering all kinds of local goods. Bateau Bay, a sleepy coastal village, was first settled in 1828, known for fishing and whale watching in May to October. Nearby Wyrrabalong National Park has lots of bird and native wildlife. Last but not least of the Central Coast places to visit include the region’s beautiful parks, such as the Lake Macquarie State Conservation Area, covering some 16kms of coastal area with abundant wildlife such as kangaroos, wallabies and colourful birdlife. Bouddi National Park is set between forests and small secluded beaches and cliffs. There is car based camping available at Putty Beach. Wyrrabalong National Park is separated in two parts by The Entrance. Excellent surfing can be had here, with wonderful coastal walking tracks and plenty of birdlife. Artisans from many places have adopted Port Stephens to live and work. The Port Stephens area is steeped in early colonial Australia history. Port Stephens has three wineries with well stocked cellars that you can visit. Dolphin watching cruises are available here, as well underwater diving and boating and fishing. Historical buffs will appreciate Tanilba House, or Tomago House with its graceful architecture set in an early 1900s beautiful garden. Try to see the Sugarloaf Light Station as well, on the coast at Sugarloaf Point. For those more into adventure, there is the 30km long Stockton Beach, where you can take a 4WD tour, ride quad bikes or go horse riding. The area is recognised as the largest coastal sand dune system, not only on the eastern coast, but in Australia. Diving is available at the Pinnacles. The largest underwater wreck in Australia lies at Seal Rocks, the SS Satara. Killcare and neighboring Pretty Beach have lots of options for beaches that are patrolled by lifesafers, as well as the beautiful coastal Bouddi National Park. If your sports minded, there is water-skiing, horse riding, even hire a boat for your own exploration or go fishing for a day or week. The region has exceptionally beautiful beaches and parks along the coast and excellent surfing spots. As well, there are 11 golf courses, all set in beautiful surrounds. There are plenty of things to do at night as well, as the area is a favourite with Sydneysiders and well catered for. Avoca and Terrigal both have in and around town, luxury hotels and resorts, self contained apartments, bed and breakfast, motels, as well as plenty of choices in caravan parks and camping. 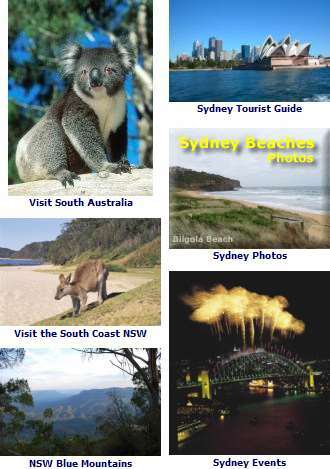 Australia Hotels and Accommodation. For a different kind of holiday, The Australian Government has made it easier for people to work in Australia. See Work in Australia.